A player at Casumo casino since December 2017, Dennis from Burton on Trent can finally cross things off his bucket list with a big £65,826 jackpot win. It’s not the first big jackpot win at Casumo casino this year, as an Irish roofer stuck it big on NetEnt’s Mega Fortune dreams slot scooping a decent €137,400 win. However, it wasn’t one of the popular network jackpot slots by NetEnt like Mega Fortune or Hall of Gods which Dennis managed to get his win, but the local jackpot slot Divine Fortune which graced him with a lucky spin. Read on to find out how much he was betting, why he enjoys playing at Casumo and what he plans on doing with his newly won mini fortune. The NetEnt Divine Fortune slot lets you bet from as little as 0.20 up to 10.00 per spin, but Dennis wasn’t betting the minimum or maximum bet, but a still very decent £2 per spin. This amount managed to secure him a lucky spin in to the jackpot bonus game where he watched as the golden coins stacked up in his favour until he had unleashed the Mega £65,826 win which was an impressive 32,913 times his bet. Those kind of amounts only really trigger in jackpot slots rather than your every day slots online, but it’s still put a smile on Dennis’s face. Well apart from 3 local progressive jackpots which are won via a bonus game. It’s a 5 reel, 20 payline machine full of mythological beasts, free spins with expanding wilds and a decent return to player rate of 96.59%. A decent casino game in itself even without a chance at winning a jackpot you’ll find some exciting spins here mainly due to the expanding wilds free spins. Beware though it you’re playing to win a jackpot, the jackpots don’t rise as big as others. This is due to only players playing at the same casino contribute to that top prize, unlike other jackpot games where all players playing at all casinos make up to the millions you’ll find in the likes of Microgaming’s Mega Moolah for instance. With a generous win of nearly £66K Dennis has already thought about what he’s going to do with his jackpot casino winnings. And unlike some other big jackpot winners who like to splash their cash on lavish holidays and fancy new homes, Dennis has a few more reserved ideas. He’s going to give some generous cash gifts to his two children, go shop around for a new car and finish off his home renovations. All of which will now doubt not only improve his but also his families lives too. Ever since December 2017 when Dennis first signed up and opened his free account at Casumo, he’s loved playing there. With lots of choice of slots and table games, along with a unique loyalty program and slot tournaments they have an all round package for players to enjoy, not only from UK but all around the world. Dennis is obviously a NetEntertainment and jackpot slots fan with two of his top games being NetEnt jackpot slots, and who doesn’t like a few bets on a roulette wheel every now and then to change things up a little. 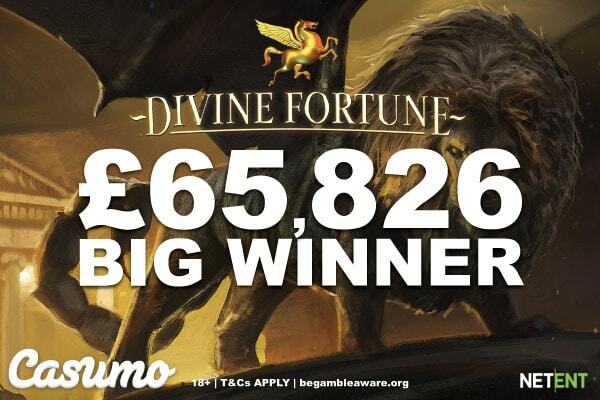 Now’s your chance to see if lady luck will grant you some mythical wins and try out Divine Fortune for yourself (even though we’d wait a little till the top prize tops itself back up) or try out many of the other popular games from the likes of Play’n GO, Microgaming, Quickspin, Yggdrasil and more. Plus with Reel Race slot tournaments all day every day there’s plenty of chances for you to win a little extra at this award winning casino site online and mobile.